Pat: “#TheThreeAmigos” That is the caption that accompanied Pat O’ Donnell’s recent Instagram post above . 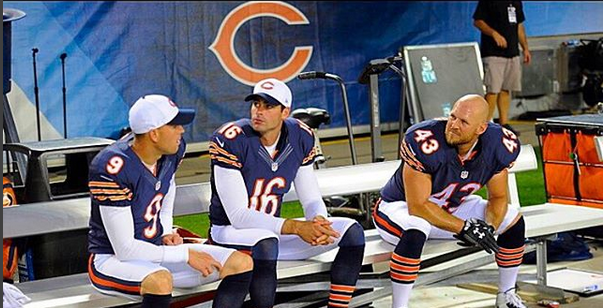 In the photo, he sits next to veteran placekicker Robbie Gould and longsnapper Thomas Gafford. The “amigos” look comfortable and content sitting next to each other during a game. I wonder if they are truly the best of friends? All rights to the image and quote belongs to Pat O’ Donnell. This entry was posted in Entertainment, News, sports and tagged Bears, Pat O' Donnell, Robbie Gould, Thomas Gafford. Bookmark the permalink.